Once upon a time I opened a book and read the words Mr. and Mrs. Dursley, of number four, Privet Drive, were proud to say that they were perfectly normal, thank you very much and fell in love. Maybe not with the opening line, and certainly not with those wretched Dursleys, but it was still the moment that marked one of my great book romances. I, like so many, many other readers, fell head over heels, why-can’t-this-be-real, I-want-a-wand, where-is-my-acceptance-letter-to-Hogwarts in love with the world that J.K. Rowling created on her pages. 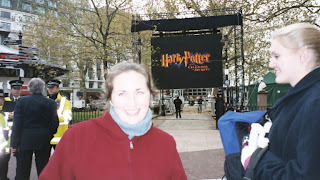 It’s a world that’s far too big to be contained between those book covers – and as the curtain opens on the last of the movies, I find myself (like so many other Potterphiles) reminiscing about what the books have meant to me. * After years of bedtime stories and me passing books down to him, these were the first books my baby brother shared up with me. He passed away five years ago and a few of my copies are even more beloved because they were his first. * These were the first books I shared with St. Matt – truthfully, I demanded he read the first one. He required no coercion for the rest of the series. They were also the first books that I made him take away and hide after Just one more chapter, A few more pages, and I’m going to set a timer and I’ll stop reading when it goes off all failed to get me out of the book and onto my homework. * When the first movie came out during my sophomore year in college I sweet-talked the local grocery store into giving us their Harry Potter / Coke display. The thing was amazing: the windows in Hogwarts lit up, Hedwig’s wings flapped. It was also massive – at least five feet tall and four feet across. Despite living in a shoebox of a dorm room, I kept it all year. 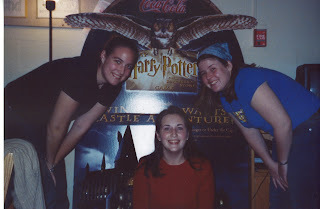 * The photo above is from the party I had before the first movie – I forced a group of friends — half who hadn’t read the book– to play Harry Potter Clue and trivia. I awarded prizes. We had cake — which was supposed to have a Hogwarts decal, but ended up reading “Happy Birthday, Harry Potter” instead. It was still delicious. * Senior year in college St. Matt, my best friend, and I absconded to London for a long weekend around Halloween. St.Matt was thrilled by the James Bond display at Harrods. J-bean loved the theater. 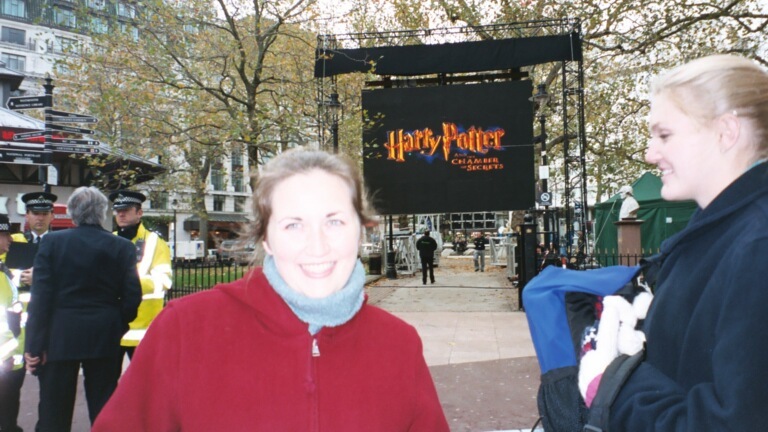 The highlight of the trip for me was standing in Leicester Square in the freezing cold for hours watching the actors arrive for the world premiere of Harry Potter and The Chamber of Secrets. I’m already ticklish with anticipation of exploring these stories all over again – getting to see them as new through their eyes. What are some of YOUR Harry Potter memories?